Sunrise Gardens #111. 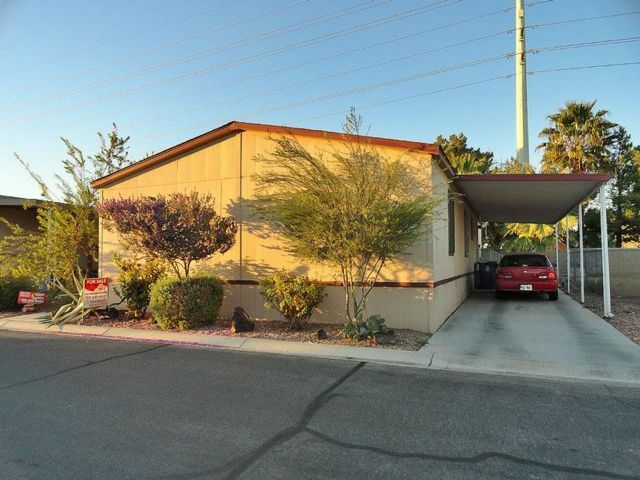 This spacious 2001 4-bedroom 2 bath manufactured home will make your family a very comfortable home. The 18x14 living room with vinyl plank flooring brings a dramatic effect to this mobile home. This home features a Chef’s dream kitchen with 7x3 center island with range and attractive fan, beautiful counter tops, upgraded faucet & sink and new cabinets. The kitchen also has a wonderful space saving hidden pantry and a side-by-side refrigerator. The dining room measures 14x8. There are 6 lighted ceiling fans throughout the home. The master bedroom measures 14x12 with a 6x5 walk-in closet. The master bathroom has a tub/shower combo. The guest bedroom measures 14x9 and has a 6x4 Walk-in closet. The 3rd bedroom measures 14x8 and has a 6ft Reach-in closet. The 4th bedroom measures 9x8 with walk-in closet. The guest bathroom also has a Tub/shower combo. The separate laundry room comes with washer/dryer. The exterior features a nicely landscaped back yard with large paver patio and a 2-car carport. This is a very well kept, newer, family park with large clubhouse, fitness center, pool/spa, playground and basketball court. Gated Access. Schools close by with an aquatic center within 1 mile.